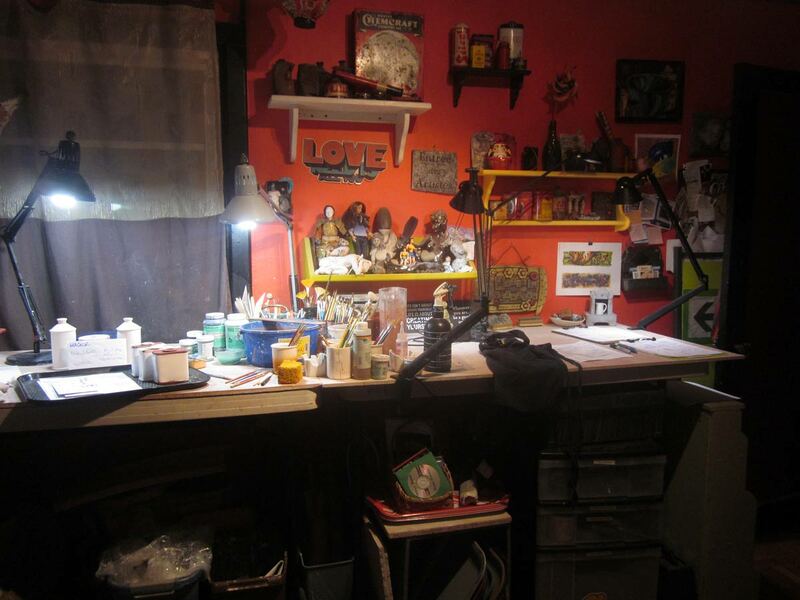 Here begins a four-part virtual Studio Tour of my ceramic-making digs. We’re starting with the North Wall and will continue in the coming weeks to the other compass points. Expect sidetracks into the crannies of my small, semi-efficient working space. I’m sharing my studio up close and personal as a way to augment my Artist Number 207 2015 Santa Cruz County Open Studio Art Tour. During that Tour, visitors can peek in, but not enter this space. Even if they could go in, they would not get this in-depth description. Besides, it’s all cleaned up then, but you’re seeing it un-staged and in use. The North Wall is the main forming and decorating work area. I stand up when I work, so both tables are on bed risers. They are topped with cement tile backing board which is a smooth, resilient and absorbent surface, and is also heavy enough to keep the plastic Costco tables from bouncing around when I really get to working those slabs! There is plenty of task lighting for foggy days and nighttime work. On the right the lights are Solux and at times I set my smallest light tent there to shoot photos. The left table is where most of the action occurs. I have all my tools arranged in a mise en place of implements, water, brushes, sponges and other most-used items. To the left, out of the frame, are tubs of rulers, dowels, and spout-forming tools, as well as special cutters and stamps. The table on the right is sometime pressed into an overflow working surface if I’m really hittin’ it hard, but mostly it provides transient staging. It also seems to be the place where I go to think, sketch, design, plan, schedule and keep clipboards of current projects and calendar dates. Futher on is a mostly-empty bookshelf and the black entry door. The room came painted red with black doors and trim. I added a few more tones on the doors, but basically left it in its teenage angst period. So….that wall behind the work tables. 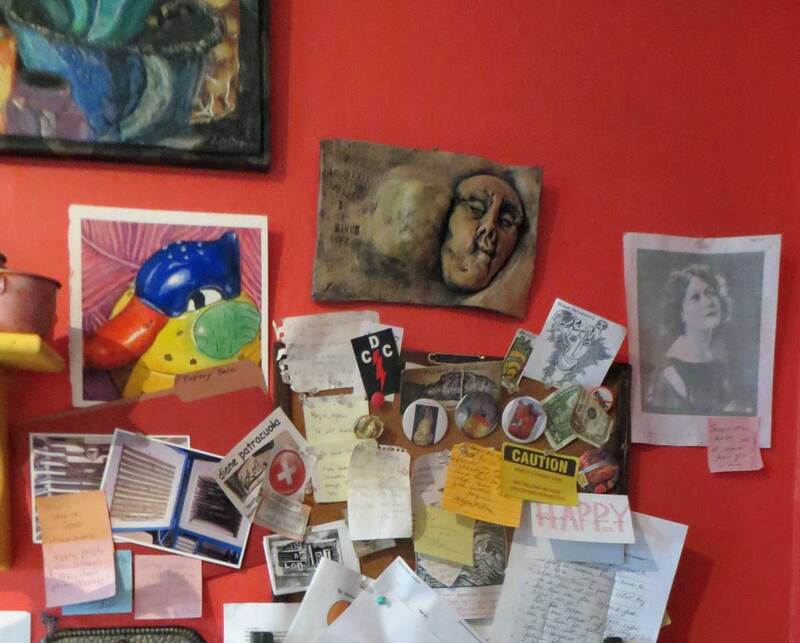 The lowest wall shelf contains personal Muses and Talismans, all classics in some way. One of them wears a necklace holding a 5,000 year old Mesopotamian cylinder seal that features three women potters. There is Tragedy (a sculpture of a runner who’d lost her race), Comedy (many mini Wonder Woman action figures), Vintage (the Sphinx) and Newly Minted (the Lammily doll.) It’s where I look to think, from either work surface. The rest of the wall is full of cans – real and ceramic – samples of rust (one from a beach in Ireland), signs, sayings, the art of friends to keep me company. These two work tables can be scary places: so much is not clear in the creative process and demands my best to make it so. It’s good to have such inspiring company when I divert my eyes from the work at hand. The bulletin board which never gets cleared, only added to! More art. My longtime Muse Isadora Duncan on the right. (She’s also represented on the shelf of Muses.) My aprons, real and ceremonial hang on pegs behind the door as well. 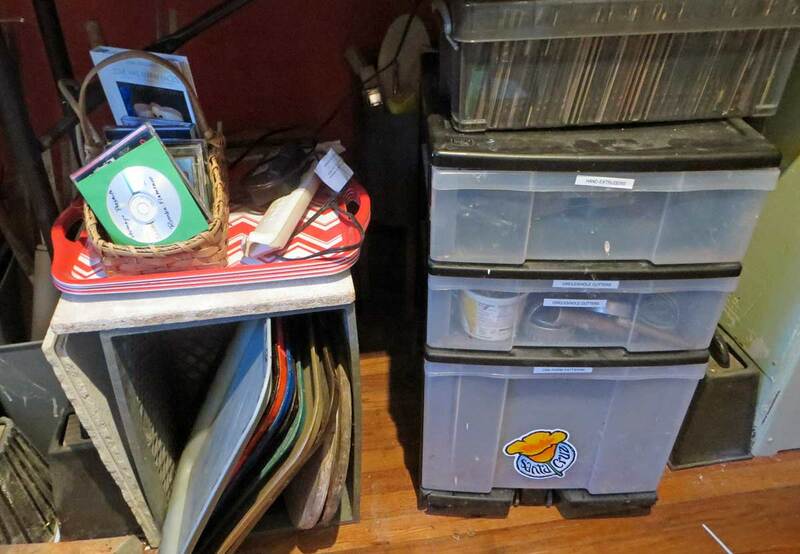 On the left, deep storage in the back corner, larger wareboards (which need thinning), a tub of plastic wrap, a trash can. 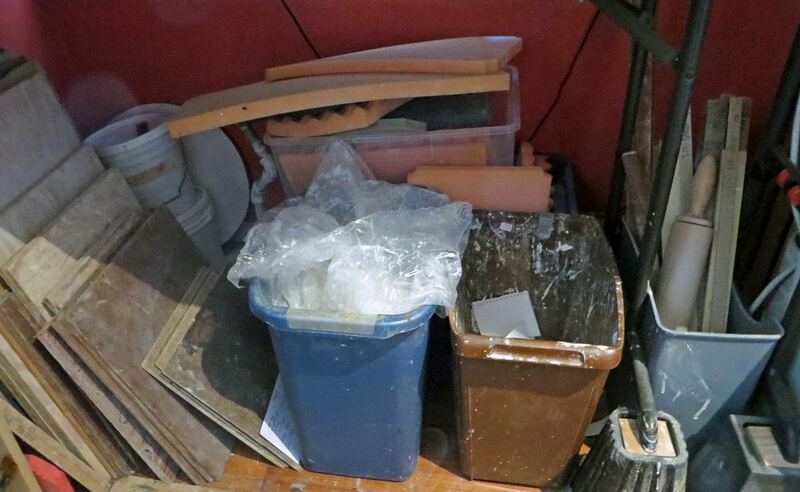 Pieces of support foam straight back – which also could use a bit of a purge. Lastly a tub of gauge sticks, dowels and rolling pins, used for getting my larger slabs smooth and even. Everything here is meant to be easily grabbed and not searched for. And on the right, trays for moving work around the studio or back and forth to the kilns out in the garage. A storage cart with hand extruders, circle-makers and cutters and a drawer crammed with reference files for specific shapes and styles I want to make more of. I should move all those CDs, as I never listen to them like I did years ago: too many gunked-up CD players, even when I try to be good. In back of the drawer cart (which is on wheels) is all my glazing formula books, chemicals and supplies. I hardly use glaze these days, much less mix it up myself! Probably should take a look down there after Open Studios and edit. So, that’s the North Wall. I spend the most time in this part of the room. I call it my Cockpit of Creativity and it needs tidying the most often, too, sometimes daily. Next post: the East Wall. –Liz Crain, who dreams of a Dream Studio, like those of a few other ceramic artists she knows, but also feels that what she has is just right. If you are in the Santa Cruz area on October 10-11, please come by to see the space, me and my work in person. Details here, or send me an email with your questions on my Connect Page.